If you're like me, you get hundreds of e-news and blog posts around this time of year talking about the importance of starting fresh - improving your life for the new year in every way - health, finances, relationships, personal growth. Lose weight...get in shape... save more money... make more money...have more friends...buy this...sell that. In some cases, it's easy to know what to do. If you don't like the service at your bank or with your credit card, you'll drop it or switch to another one. If you don't like how a friendship you've had has been going, maybe you'll reevaluate, or find new people to spend your time with. If you don't like how your career is going, maybe you'll get a new job, start your own business, change fields entirely. One of my theories in life is that change is not so hard once you identify the problem. However, one of the hardest things is identifying what needs to be changed when maybe it's not so obvious, and that's where we can get into trouble. Increased self-awareness can help us address problems as they come up, rather then waiting weeks or even months, which may cost us greatly, either financially or emotionally. If we have been doing the same thing the exact same way for years, does that mean we should continue? Why have we done it that way to begin with? Is the first thing you think of necessarily the best answer, or is the answer one of 10 or 12 possible solutions? Many aspects of life are not as easy as changing channels when we don't like what's on tv. Sometimes, for example, I'll be driving along on the highway and realize something has been bothering me for weeks, only I didn't realize it. Why didn't I? Was I too busy, or did I just not want to face it, for whatever reason? Or maybe when we weigh the pros and cons, it's really not worth making the change after all. Some of our decisions are based on life experience. 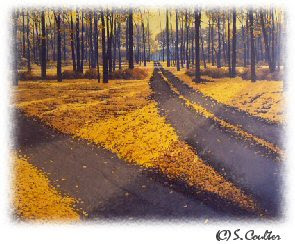 If you are going to try a new path in life, how many years do you really have to try it out? Are other people giving you advice you value about this change, and should you follow it? Have you done anything like this before? Some changes are obviously more critical than others. Changing your breakfast cereal is not as monumental a decision as deciding to bicycle through Europe for a year. Or is it? Some would say it's never too late to follow your dreams, but you do have to think of the consequences every time you make a change. One helpful solution which I practice, is to start small. I want to read more books this year, so I'm going to start by organizing my reading pile and allowing even a short time each day to focus on one book. I want to get back to running, so I'm going to start small by just running about 20 minutes at a time as often as I can. But more importantly, I'm going to start listening more to that little voice in my head that pops up once in a while. In the meantime, have a happy and healthy new year, and by all means, if that show your watching doesn't work for you anymore, change the channel. It's easy.